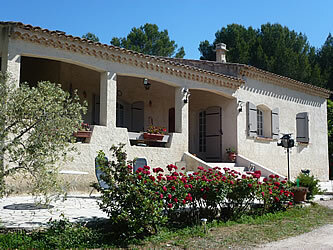 Between Aix en Provence and Salon de Provence, in the shade of a pine forest, Anne-Marie and Denis Bergese are pleased to welcome you in their bed and breakfast. Located southwest of the village Lambesc and west of the village of Saint Cannat on the road to Coudoux, the guest house, air conditioned, is the ideal setting for a quiet and relaxing holiday, surrounded by an enclosed park of one hectare. Free parking available with automatic gate and remote control. Halfway between the Luberon mountains and the Baux de Provence, you will have the opportunity to discover the charms of Provence (perched villages, Provencal markets ...).